Sinus Buster Weight Control formula is the first commercially available natural nasal spray designed to curb overactive appetites, and it's being touted as an effective hunger control solution in the current issue of Women's Health Magazine. 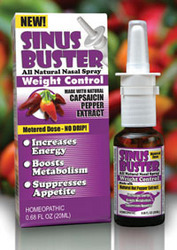 Sinus Buster all natural nasal spray has a loyal following thanks to its reputation for beating sinus, allergy and headache symptoms. Now there's another weapon in the brand's arsenal aimed at fighting the battle of the bulge. Sinus Buster Weight Control formula is the first commercially available natural nasal spray designed to curb overactive appetites, and it's being touted as an effective hunger control solution in the current issue of Women's Health Magazine. The active ingredient is Capsaicin, a natural chemical found in hot pepper plants. While capsaicin has been shown to relieve a variety of sinus and headache related ailments, it's also been proven to reduce hunger pangs and burn fat. Women's Health Magazine found Sinus Buster's Weight Control nasal spray to be highly effective in reducing hunger pangs while also providing a noticeable energy boost. While the burn associated with hot peppers lasts only a few seconds, the appetite reducing effects can last for several hours. The unique combination of capsaicin, green tea, licorice root and Chinese ginseng is designed to increase energy and boost the metabolism without the complications of added stimulants. According to Wayne Perry, the product's developer and Director of Innovations for Dynova Laboratories, nasal sprays provide a fast way to reduce an overactive appetite. "The speed of effectiveness with a nasal spray is extraordinary especially when you use capsaicin. What makes the Sinus Buster Weight Control formula so appealing is it reduces your appetite, and acts as a carrier for other herbals allowing the formula to permeate the blood-brain barrier. This delivers a low dosage throughout the body with immediate results. It's a natural way to help you eat less food and burn more calories". To find out more about Sinus Buster Weight Control nasal spray, check out the September issue of Women's Health Magazine now on newsstands everywhere, or visit the official Sinus Buster website.